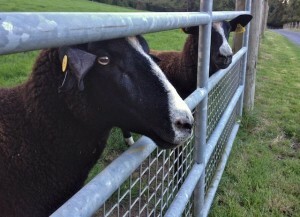 So for my own amusement I set the iPhone on a fence post and tried to #DoTheHeff with a small part of my Zwartbles flock following me. I thought nothing of it once I had posted it and Hector retweeted it as did a few others. Then on Wednesday less than a week after posting it onto you tube I was showing it to someone and suddenly realized it had had over 5000 views. This is more than all my short films have been viewed together. I just hope Rob Heffernan takes no offence at a flock of black sheep taking the micky and trying to walk his walk. I’m sure some of it had to do with the fact that the Irish Independent had posted an amusing note about it on their website and also that Hector o hEochagain is very popular.